The list goes on… but regardless of your real estate flavor of choice, it’s pretty clear-cut: leads are the lifeblood of your business, and one way or another it all seems to start with the distressed seller. In our wholesaling business we actually have a number of channels actively generating distressed seller leads for us, including referrals, signs, and JV partners. But hands down, the lion’s share of our wholesale deals come to us through our direct systematic direct mail marketing efforts. And ultimately from quantity to quality in the leads themselves. Whether you agree or not with our little experiment here, I think you’ll really find it interesting. And I’d really love to hear what you think about it with a quick comment below. Hey, what’s up guys? JP here and today I want to drop a little resource on you. It is the favorite postcard that I’m working with right now in our wholesaling business. It’s the postcard that’s been working well for us. We crafted this postcard specifically because we wanted to tweak our campaigns from generating a lot of leads that were very unqualified to generating fewer, better leads. By the way, this image is just something fun to look at until I get to the real stuff. It’s just a funny image that you’ve probably seen randomly on the internet. Interesting stools there that those nuns are sitting on. Any who, prior to the postcard that I’m about to show you, we had been using a lot of letters. We have had great success with our letters. We’re getting a lot of calls, a lot of calls from that postcard, but we wanted to just qualify them a little bit better, have a little bit more on our postcard and see if we got a different type of results. Fewer, better leads is kind of our aim. So the postcard I’m about to show you does a little bit more in terms of the information that it shares. And I just like it, you know, you may wonder why we have changed and why we’re trying new things. That’s a marketing practice that we believe in firmly; that is, constantly test and tweak what you do. You don’t want to throw out a good campaign, but you should always be testing new things and seeing if it outperforms your tried and true. Bam, that’s right, it looks like a yellow letter does and it’s kind of interesting, you know. Handwritten postcards are kind of the new thing lately. In fact there’s whole courses centered around it from people that are friends of mine and I know, like, and respect. This postcard is based upon a template I got from one of the yellow letter vendors. I took their template and then kind of made it my own. I just basically edited it using their little online editor and, so I just want to take you through it now. 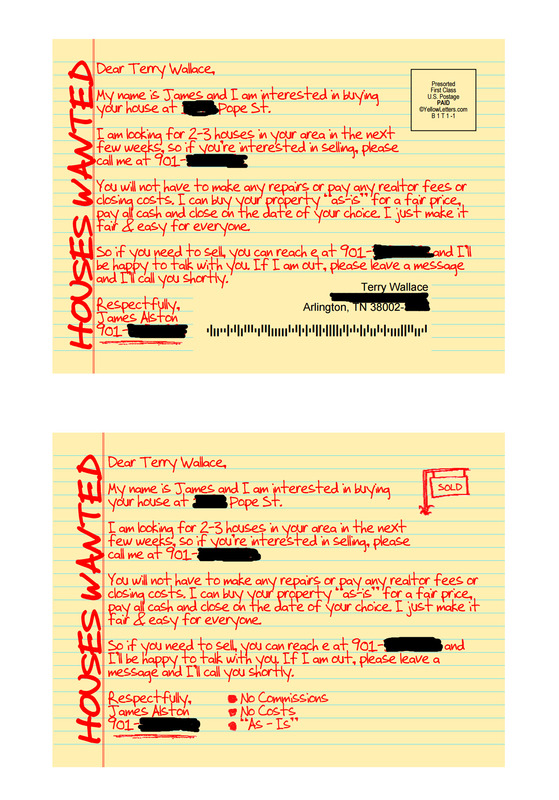 “Dear Terry Walls.” First of all, if you’re not familiar with the, the yellow letter phenomenon, you know, for a long time in real estate investing arenas, people have had great success with yellow letters. Yellow letters aren’t as effective as they used to be because so many people have been using them. But these postcards that look like handwritten yellow letters are kind of like the new yellow letter in a lot of markets. So, even though it looks like a legal pad size paper, turned on its side, this is a small postcard. Okay, I’ve just got it blown up giant for the video here. So, first thing I love is this whole “houses wanted” on the left hand side. I just think that that really gets your attention in a very simple way. It immediately tells you what this is about. “Dear Terry Wallace, my name is James.” By the way, James is my partner with The House Guys. So just so you know why it says that, he’s the one who handles talking to sellers. “My name is James and I’m interested in buying your house at”, and I blocked out the address “Polk Street. I’m looking for two to three houses in your area in the next few weeks. So if you’re interested in selling, please call me at…. You’ll see there’s a local number here. “You will not have to make any repairs or pay any realtor fees or closing costs. I can buy your property as is, for a fair price, pay all cash and close on the date of your choice. I just make it fair and easy for everyone. So if you need to sell, you can reach me at…”. And by the way I realized there’s a “m” in “me” left off here. So please, uh, grammar nazis, don’t crucify me for that. Just a little mistake, but you know, I think people will be able to understand what it is, what it means. Again, there’s our number underlined and then the three bullet points, no commissions, no costs, as is. Now, this is not a flashy hypey postcard. I find that I don’t do as well when I use things that feel like hype to me. A lot of very successful marketers disagree with me, but personally I like something that has a very average joe, folksy feel. I want it to seem like it was written by a real person, so I very carefully reworded and crafted every piece of this to seem like it was. I mean, I am a real person, so I did really write it, but I want it to seem like somebody literally, without putting too much thought into it, just wrote it out. And you know, one of the things you’ll notice is there’s not a single exclamation point anywhere on this. My philosophy is more and more now, exclamation points are spears. They stab at you when you see them in marketing messages. I much prefer to end in periods or even question marks. I don’t have any questions on this, but question marks are great. They draw you in and cause your mind to your subconscious mind to start trying to answer them. So remember that exclamation points are spheres, question marks are hooks that draw you in. Periods are just, I guess, neutral, but still a good thing to use. I liked the little hand doodle of the little sold sign. I think that’s kinda cute. And it’s not too much, this is a simple, straightforward message on the postcard, but it’s more than the message on the previous postcard. I also, I don’t like that some of the messages on some of the yellow letters say, I want to buy your house. This says I am interested in buying your house, but it doesn’t come out and make it seem like, hey, I just know I want to buy it. Like if you’ll sell me your house, I’ll buy it. That’s the way some of the marketing comes across to me now that I see a lot of investors using. And this one in no uncertain terms uses their address and highlights, “I’m interested in buying” and I don’t know, that just has a little different vibe to me. It’s not quite so hit me in the face with this, I want to buy your house. It just, it feels better and it’s pretty clear that I’m looking for several houses in the next few weeks and then kind of puts the ball in their court in a very respectful way. “If you’re interested in selling, please call me.” So I like that. I just ending it: “respectfully, James”. Also, I just feel like this has good vibes, this postcard. You’ll notice the local number. I’ve already mentioned that, but just for what it’s worth, I know I’ll get this question. Currently, our local number goes through Vumber. We use Vumber for all of our local numbers, but we have it forwarded to a live answer, so we have somebody live answering those calls for us and inputting the information into Podio and then it shows up as a new seller lead in Podio account. Now this is the one side of the postcard. Let me show you the other side. There it is. You’ll see it’s the exact same text. There’s really nothing different about it at all except it’s missing the little sold sign because that’s where the stamp is going to go. First Class stamp, by the way. And there’s this space for whoever is being mailed to, obviously here. So same message on the front and back. Okay. In terms of where I am in deploying these postcards from, this is from yellowletters.com. And there’s a link on the page here to take you directly to the postcard. It should lead you directly to the postcard. Actually, if you scroll down, you’ll see there’s a section for yellow letters postcards. Go into that section and if you want to kind of use the same starting point as we did, I chose rather yellow postcard, the number four small postcard. And then once I click on that, it will open up and I can edit that postcard and decide what I want to put on it. So, if you’d like to model my postcard, I would open up number four and then you can just use this image as your guide and of course. Feel free to test it and tweak it on your own. Try a different message, if this one doesn’t quite represent you the way that you want to. But I will say there’s a lot of ninjary, if that is a word, that’s embedded in this postcard. So, I think it’s pretty swift. I’m pretty happy with it myself, and happy to pass it along, guys. Patrick and I love sharing with you what’s going on in real time in our businesses. You are our insiders, that is your privilege. You get to know what’s going on and you get to benefit from it and test it out yourself if you want to, whether it’s a form or a checklist or a contract or a marketing piece or whatever it is. So, there you go. Thanks guys for tuning in. JP out. The cost varies depending upon how many mail pieces you order. We ordered 4,944 of these postcards at $2,470, which includes the printing and the mailing with first-class postage, and that comes out to about .50 cents per piece. Totally worth it! This was, of course, a large-volume mailing, so the price per piece varies depending upon the amount in your mail campaign. Enjoy living on the edge? Want to give this here fancy postcard a try for yourself? Feel free. You could remake this postcard a number of ways, but the easiest would be to just use the same folks we do. Here’s a direct link to the company we use if you want to have them print & mail the exact same postcard for you. Like I said, I’d love to hear what you think. Maybe you’ve tried an approach like this? Let’s hear about it. Had success with another real estate investor postcard or yellow letter lately? Do tell. This concisely covers all the bases. Also, what a great idea to record the phone calls. Perfect. It appears this will stand out, just as we want! Perfect! Should stand out! Just what we want! Thanks for sharing. It’s good to know what’s working and what’s been over used. Nice natural approach to motivated sellers. Love your stuff.. keep it coming. This is a great deal of AWESOMENESS! !….I’m learning a lot from your blog so thank you so much! Nice, is that a custom font of a standard font in Word? I’m not honestly sure, Stephen. I created this postcard so long ago, I can’t recall anymore. Brain cells and whatnot. I really like the script… It makes the conversation flow and thanks for the tip on recording all calls. I have something else to try. I am always looking to improve my approach and this surely looks like a good jump start. Yet Again, some great sharing going on here 🙂 Two thumbs up! Post Cards now seem like a great media idea. Have not considered Post Cards. Something to try. Good stuff guys! Keep ti coming! Thank you. Looking for something like this to try. Thanks for your selfless sharing. Thanks for the awesome kindness. I’m eager to give this approach a try. Thanks for making it available. Hi Guys, thanks for all the great information and comments. You’re welcome, Theron! Glad you are finding the resources useful! use it in your business. Thanks so much for the comment, Annette! Thanks for your sharing your golden nuggets. equity%, and absentee owners. I’m a newb so, how does the 20 or more years factor in? Does that guarantee free and clear mortgage? Those properties are more likely to have a lot of equity. Not guaranteed to be high-equity or free and clear though. This is great, I enjoy your site!! I’m no real estate expert, not in the least. I haven’t done any deals yet. I heard your reason for why you used the word “interested” in buying your house. I think it was great to use. It gives the impression that you desire it but don’t demand it. However, the 2nd paragraph throws me off, as would possibly a potential seller, when it states, “I’m looking ‘FOR’ 2-3 houses in ‘YOUR’ area…” To me it kind of contradicts being interested in their property. My suggestion is that it changing the word “For” with “forward to purchasing” would make a better supporting connection. Also, instead of ‘YOUR area’ substitute it with “THIS area’. But either way, I like the whole idea. thank you for your help, this is GOOD. Insightful simple enough just might work looking forward to the download. Nice post card. Which service do you use to answer your phones? Which lists do you send to voicemail? I heard in one of the blog you send to VM too. I hope this works to improve my business. to throwing it in the trash. Looks great. Hey Svetlana, the download link to see the postcards is on the page here. Thanks for the post card samples! You’re welcome Mark! Now send it out to some motivated sellers. Thanks JP & Patrick. Appreciate the “ninjary,” lol, marketing tactics. Keep’em coming. Ummm…the sample JP used in the video…where is the return address? It strikes me that if I were to mail to vacant property owners I’d want the USPS to return any undeliverable postcards so I can order a skip trace for that property. Thanks. Nice effective postcard. What was your conversion rate on it? Hey Laura, the conversion rate is going to depend on the type of list you’re mailing and how targeted it is. And other factors. What’s most important is to track your results so you know what’s working and what’s not. I have recently stumbled upon your site and really love all the blog info you all have. I have recently started my whole sale journey but have yet to do a deal. I have some some craigslist and Facebook campaigns but my phone is still slow to ring. As a newbie seeing all the info out there I have no idea where to start. I have thought about doing a mailer but am not sure. What would you all recommend for a newbie to get his phone ringing. I and my pals have been a HUGE ‘fans’ of J-P Moses and Patrick Riddle for … well … almost forever. Now that they’ve joined ranks as AwesomeREI, who among us CANNOT benefit? Hi ya’ll, I kind of like that this piece.Place send a word to me of this thing you’re talking about. I believe I will be excellent at it. Keep it rocking fellas! Hey are you using the equity% field when you filtering for high equity? Also are you mailing out to out of state owners or both? Do you also mail to the home owners with this same card? And what percentage have you gotten with this postcard to that list..
Hey Dwanell, for my part, I typically aim for equity based on how long since the property was purchased. So in other words, I’ll pull an absentee owner list for my favorite zips, but filter it for “Last Sale Transaction Date” to be 20 years ago or more, for example. We frequently use this criteria for absentees (in state and out of state). I’ve never mailed to homeowners with this specific card… at least not yet. And I couldn’t tell you the percentages…. we should track that better though. It’s probably in another blog entry, but where do you get your lists from for the postcards? Hey Roy, we get mailing lists from multiple places. Some of them we gather ourselves and others we purchase. For example, we purchase absentee owner lists by zip from Listsource.com. Prices range from $0.12/lead to $0.07/lead, depending on volume, and we usually tweak the criteria to narrow it down to people who likely have equity and have owned their home a certain amount of time. We also do systematic gathering of abandoned house leads ourselves, and we can pull down our local county tax defaults lists anytime. We used to gather probate leads ourselves, but now we use a company who does it all for us. This sounds great! I was wondering if u buy a house from some one that is willing to owner finance, can u use a “subject to” contract or some thing else? Hey Steve, thanks for the comment. To your question, you could simply amend whatever standard contract you use to say something like, “Property is being purchased subject to existing mortgage in the amount of $_______, which will remain intact after closing and will be paid monthly on-time by buyer.” Friendly disclaimer, I’m no sub-2 expert… but that seems a pretty simple way to morph your contract into what you need it to be in that kind of a situation. Thanks.I am going to use this postcard in my next campaign. Hey Peter, let’s us know how it works out for you. Great stuff, love you Awesome ness guys. Hey Scott, glad you’re loving our stuff! Thanks for joining the conversation here. Appreciate all the great info. newbie at the real estate investing venture. Hey Gerry, glad you’re enjoying the info. Let us know if we can help you with anything.